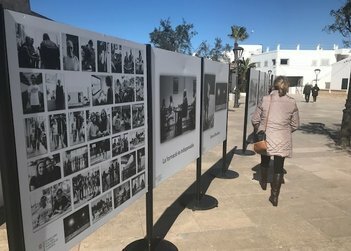 Formentera's Office of Social Welfare reports on the opening this Wednesday of a photo display in Sant Francesc's central plaza. In El voluntariat: una mirada transformadora, Yago Soria shares the reflective take on volunteer work that earned him the Art Jove prize in a recent contest of young photographers. The travelling, twelve-piece display of 1.2-metre wide prints and accompanying texts is presented by the regional minister of culture, participation and sport. Part of Soria's quest to provide visibility to volunteering in the Balearics, the show has already made stops in Palma and at the Universitat de les Illes Balears and plans are afoot for more on Eivissa and Menorca. The Council wishes to launch a call to all islanders interested in volunteering to assist the organisation of the sixteenth Festa Intercultural, Sunday, April 8 at Mestre Lluís Andreu primary school. Volunteers can register for that and other events by following the above link or visiting the Office of Social Welfare (àrea de Benestar Social).